James Hellwig, aka The Ultimate Warrior, has died at age 54 after reportedly collapsing in Arizona. We don’t usually eulogize wrestlers, but this one makes me feel bad. I watched The Ultimate Warrior rise through what was then known as the WWF in the late 1980s and ’90s. This was before Vince McMahon was forced to clean up the “sport” a bit, and back when it was a dirty little secret that you pretty much had to be taking steroids if you wanted the fans to love you. This was because it was nearly impossible to keep that size when you were barnstorming across the country and getting in the ring with injuries several times per week, with scant time to get in the gym. 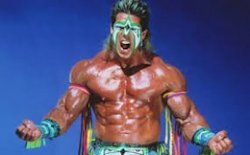 From that standpoint, The Ultimate Warrior was scarily massive and ripped, the most muscular guy in the sport. That didn’t look so much like prime conditioning when he got in the ring, shook the ropes violently, and then he would get bright red and seem winded before the match began. He would fling his opponent around the ring a bit, pick them up and drop them and it would be over. I found myself worrying for his health even back then. The WWE just named him to its Hall of Fame on Monday night, and he leaves behind a wife and two daughters.